Lifting Hoists Direct is proud to be a UK leading supplier of Yale hoisting equipment and can offer an excellent range of Yale lever hoists at extremely competitive prices. 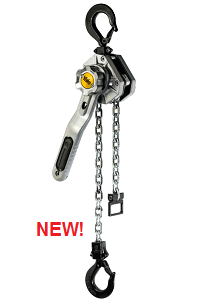 We are one of the first in the United Kingdom to offer the brand new innovative Ergo 360 lever hoist which was developed to expand the 360 degree range of hoisting equipment which includes the popular and successful Yalelift 360 manual chain hoist. The new range of the Ergo 360 lever hoists consists of 3 models with various lifting capacities, 750kg, 1500kg & 3000kg which will more than cover most mainstream every-day tasks. Alongside the exciting Ergo we also offer a number of well tried and tested Yale pull lifts which all have individual properties to suit various lifting applications. First up we have the D85, often referred to as the original Yale pull lift and perfect for heavy duty operations with working load limits up to 10000kg. 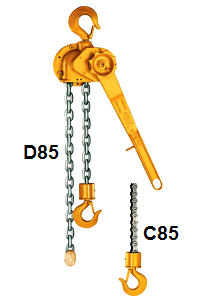 The C85 pull lift is the sister of the D85, it is essentially the same but with a roller chain, and also boasts WLL up to 10 tonne. The Yale pull lifts AL range is a lever hoist made from aluminium and is one of the lightest lever hoists on the market. We also supply the smallest lever hoist on offer from Yale, this is the Yale Handy, and the top model in this ‘handy’ range weight is at just 2.8 kg yet has the power to lift up to 500kg. 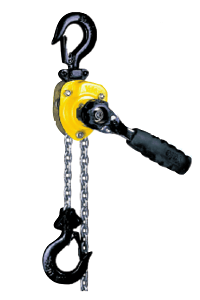 The PT ratchet lever hoist is made from pressed steel and is good for the majority of standard operations up to 6300kg. Last but not least is the Yale Uno plus ratchet lever hoist, a compact economy hoist range with working load limits up to 6000kg. Spare parts are available for all Yale pull lifts and we can offer a full servicing, inspection and repair package. Yale is a trusted brand with products you can rely on; please compare the products carefully to ensure you choose the best lever hoist to suit your requirements, and/or you can call or email us for friendly advice if you need extra help.